Forza 6 is coming in just a couple weeks to the Xbox One, with the demo out I take a spin in the Ford GT and Impreza 22b to show off what the game has to offer. Last night Bethesda kicked off their first E3 showcase, previewing some of their biggest titles yet. With a night to sleep on it, does it really stack up? This week kicks off the release of the Forza 6 demo on Xbox One, as a change of pace I decided to capture some of the gameplay to showcase what to expect. Since I’m doing a single installment I’m breaking these down track by track in text but the video will cover the experience. Not all videos will be this way but when it’s something new and pretty direct like this I might change it up. That said, I used the stock Xbox One controller, I don’t have a racing wheel for the system so that’s where things will come from on the platform as I’m not sure when I’ll pick one up or if any companies would be interested in jumping along with a donor. Video removed for now – Content ID claims for music made the original recording impossible to use. I’ll have to do another recording without the soundtrack. Future note, if you want to use Forza 6 footage on Youtube, the content creators will flag the life out of your videos. Unfortunately it doesn’t seem that Microsoft has sorted out anything to help the community at all. First up we’re in Brazil on Circuito Do Rio De Janeiro in the 2017 Ford GT, the supercar takes to this street course against a pretty heavy lineup of opponents. As the first experience of Forza it’s also the safest delivery, the game sets all the controls to easy mode so you’re coddled along with safe lines, turning assist, braking assist and assist assist. For some it’s perfect because you have kids or others playing so you can just hold the trigger and basically have a racing experience. If you want to fudge the controls you can do manual braking and line switching and escape the grasp of the support system to some degree. It’s a beautiful track though and without the assists in a Ford GT I think many players would leave chunks of that car scattered throughout the stage. Fortunately that’s not the case and it’s just scuffed bumpers and lots of rage in the narrow corridors of the track when passing feels nearly impossible or line blocking becomes the most frustrating experience in history. After you complete the first level you jump into car selections, yada yada yada classics skip the hubbub pick your favorite car / the Subaru Impreza 22b or RX7 (it’s okay you know you want to) and jump into the mix. The first of the qualifying series brings players to the Lime Rock Full length track, it’s 3 lap race where players work on coming in Top 3 over the 1.5m course. The track is fairly relaxed with open corners and lots of wiggle room, if you’re new to the game leaving it on easy or normal is probably a good choice to understand things a little more with the car selected. The AI tends to let off in the easier corners and avoid any connections on the rumble strip so passing is usually possible on most inside turns. Following Lime Rock is Yas Marina Circuit, for some it’s a pretty awesome track full of challenges… but it’s always been a nemesis track for me. Yas focuses on grip and downforce and without the right mixture it means going off-track is a given and struggles to regain that grip will act as a constant throughout the race until a steadier approach hits. This race isn’t a pretty one but I’ll keep taking cracks at it until I’m able to really produce a clean run without having to resort to flashbacks. With Yas turning to a distant memory the qualifier skips to a drivers challenge with a battle at Indianapolis Motor Speedway for a 7 lap Indy run. Going from heavy corners and low 100mph speeds to 220mph is a change of pace, fortunately as long as upcoming traffic patterns are anticipated correctly it doesn’t turn into a nightmare. The goal of the race is high-speed without ramming the car up the backside of all the opposition. Key things to remember are the behavior of the car under acceleration and deceleration as those will become critical during passing. It’s an enjoyable break and for the most part the experience was clean minus a few bad calls or late turns where I did end up touching with other cars. The last leg of the journey ends at a wet and rainy Sebring International Raceway, it’s a nightmare to say the least with puddles and hydroplane for all. The key factor here is harnessing the power of the car to avoid bad slips when crossing puddles. For those in RWD cars that means working the gas as needed to keep up control of the car without sending the car into a race ending spin. Traction is obviously reduced and plowing the car off the track with understeer increases along with it, so it’s just a wild wacky fun zone of under and oversteer with a side of traction loss and spin. Gotta love it. The 22b used the AWD to its advantage most of the track to help pull it through fudged corners and away from the pack in general, it’s a good overall car but it’s not without challenges in Forza 6 as seen with Yas Marina. The demo is a well-rounded experience for Forza 6, good variety of cars and tracks and it showcases the weather system and some of the custom options for players. Given the full game is only weeks away it’s worth checking out if there is any interest in the game, on top of that players can also earn special perks that transfer over to the retail game so why not? 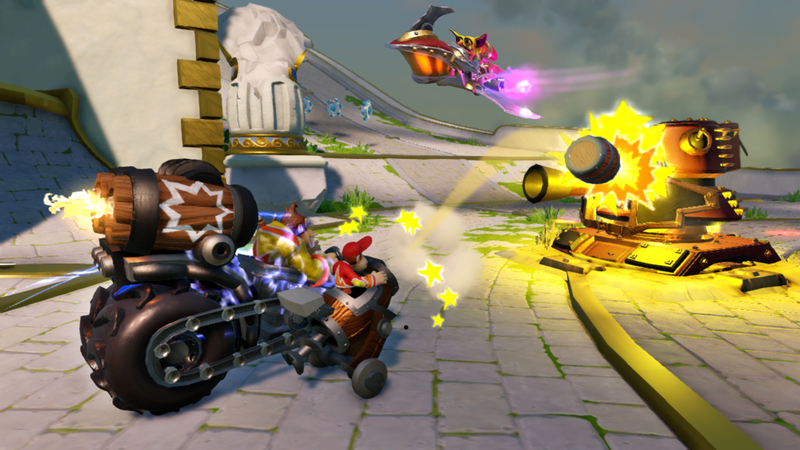 So Skylanders has a sequel for 2015, not really a shocker but there are a few items that stand out in the demo made available at E3 this year. One, the trap team pieces will have a function in the new title which provides elemental bonuses, it’s handy and a nice way to keep pieces relevant between generations. Two… the game incorporates racing / driving into the mix and while that allows them to gain traction on other popular franchises it’s the incorporation that hurts in this demo and by hurt I mean it really kills me a bit to see racing used so loosely. Most racing titles have adopted the standard of triggers as acceleration and braking mechanisms, they work well they’ve been doing this for ages as they’re not an on or off mechanism and they’re not bad to reach for most hands. Unfortunately Superchargers doesn’t want to follow this mindset, it now works to redefine how these controls work and make them a bit more complex than they need to be and even worse, it makes them harder to use than other titles on the market. 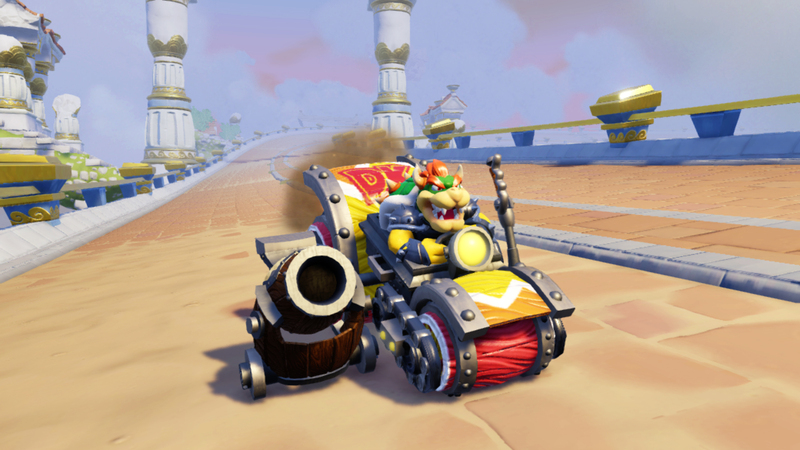 A key point here is drifting your car in-game, normally there’s an e-brake for this in sims and arcade racers but in children’s oriented games they allow tricks, flicking the brakes and gas on and off or other sequences to create it, Mario Kart has done this for ages. Instead we’re stuck using trigger acceleration and buttons for braking or sliding which don’t mesh well. For some it doesn’t sound odd, but it really is, let the thumb direct the car, the fingers pull the gas or brake and go from there as it minimizes the actions of the hand and in the event someone is using the right thumb for action it’s fine because it’s largely just sitting there on the gameplay anyway. It’s not Forza and even Forza doesn’t make this mistake, worse is that even if that was addressed there’s also a problem of inverted steering when deviating from a normal path. Going onto that half-pipe? Sorry, you controls stopped making sense. Going up that other side path straight ahead? Nope, doesn’t work there either, let’s flip those for you and turn every experience into opposites. It’s problematic because a childrens game is designed to be accessible and fun without overdoing it and alienating them while their older siblings or parents get it and tear things up. As it stands, Superchargers fails to consider the key demographic behind the game and offers a subpar performance in the car area. I really hope they’re able to pick things up in the future before release otherwise it’s a title I’d really hesitate to pick up. It seems like Activision would have put more time into the control system of the cars but in the current state it’s more like an afterthought.